When avid weather watcher Michael Janitch (aka Dutchsinse) uploaded a video showing that microwave pulses preceded the formation of Typhoon Yolanda-Haiyan before it hit the Philippines, the video went viral, prompting several Filipinos to send it to local news stations asking for an explanation. Reputable news sites covered Janitch’s information, which must have really bunched up the tighty whities of military figures, because within days the same news sites called out this ‘conspiracy theorist’ and denied basic physics that microwaves can and do impact weather. The Philippines’ top hazard assessment scientist denies that electromagnetic waves can influence weather or cause earthquakes. Take cover, Filipinos, because the Executive Director of Project NOAH (Nationwide Operational Assessment of Hazards), Dr. Alfredo Mahar Francisco A. Lagmay, is woefully mistaken or deliberately lying to you. Not only do EM waves impact weather and earthquakes, but scientists have learned how to use these waves to do just that. Since the mid-1990s, with the creation of HAARP, the High-frequency Active Auroral Research Project, this technology has been developed and deployed. HAARP manipulates the ionosphere with directed radio waves that then target an area in ways that interfere with electronic communications, prompt earthquakes and yes, direct and enhance storms. There are some two-dozen known HAARP-like stations around the planet capable of interacting with the ionosphere. If the technology didn’t work, would they have built these additional stations? Governments have long been studying the ionosphere. At least as early as the 1970s, ionospheric labs were (and are) stationed in Boulder, Colorado; Juliusruh, Germany; Průhonice, Czech Republic; Akita, Japan; Vasilsursk, Russia; and Rome, Italy, among others. “[R]eports have emerged that the Category 5 storm, one of the strongest typhoons in the world, was caused by a microwave pulse. “A microwave anomaly has been observed in the West Pacific, causing a heavy rotation to develop and eventually creating a large storm. Tropical storms caused by microwave anomalies or beams were previously discussed by Dr Michio Kaku, the Weather Channel and CNN…. 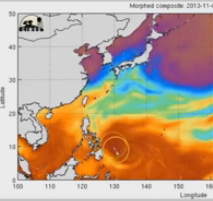 IBT also uploaded three of Dutchsinse’s videos, linking microwave pulses to Typhoon Yolanda-Haiyan’s formation, to the recent Taiwan earthquake, and to Tropical Depression Zoraida. But the powers-that-be apparently gave the word, prompting the IBT and other news sites to try to deny the physics. A later IBT headline asserted, “Filipino Scientist Mahar Lagmay Disproves ‘Microwave Theory’ Of Super Typhoon Haiyan”. He proved nothing; what he did was deny the technology exists and cast aspersions on Dutchsinse. A Filipino site, ABS-CBN News, devoted a 15-minute segment to the issue, using Dr. Lagmay to accuse Janitch of playing a “trick” on the world. The only direct refutation offered was that such technology “has not been proven” to be capable of directing or enhancing storms. Its unidentified newscaster made a strong case against his alma mater when he asked if microwave pulses even exist. Lord. That required the geologist to offer an elementary explanation of the electromagnetic spectrum. No doubt, many things, including high-tech weapons, would look like “conspiracy theory” to the uninformed. The “conspiracy theorist” label is merely today’s version of the medieval accusation of heresy, and is applied when power holders want to suppress information by discrediting the messenger. Prick up your ears, denizens of the planet, when ‘conspiracy theorist’ is called out… you may just learn about something real that the government claims is a hoax. Electromagnetism can be and has been manipulated for years, and Lagmay’s denial is implausible, especially given his geological training. A site like HAARP, Dutchsinse points out, can generate a high-frequency wave, beam it skyward toward the ionosphere, where the planet’s natural electromagnetic field can modulate it into a low frequency before reflecting it back down to the planet. Meteorology teaches that electromagnetic waves impact weather and climate. Geology acknowledges that vibrations set off earthquakes. On top of the damage caused by Typhoon Yolanda-Haiyan, Filipinos now have other worries, given that the man in charge of assessing hazards for their nation is apparently unaware of, or unwilling to acknowledge, atmospheric science and the long history of planetary weapons. This article first appeared at Activist Post.